Ranges from medium to difficult due to steep slopes and numerous creek crossings. This trail is not handicap accessible. Barbara Keeton donated the Ellis Hollow Nature Preserve to the Finger Lakes Land Trust (FLLT) in 2000. Keeton and her family had been lucky enough to enjoy the land since the 1970s; by donating it to the FLLT, she hoped to share it with the rest of the community, as well as ensure the preservation of the land for many years to come. The trailhead is located near the small bridge over the creek in the transmission line right of way. It is slightly difficult to find due to rampant vegetation, but opens up shortly after the trailhead. After a short walk, visitors will come to an information board at which point they can pick up a map and other information, and then pick a path. Quiet forms of recreation are preferable at the site, such as hiking and bird watching. 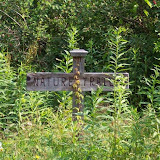 Prohibited activities at the preserve include collecting, camping, creating fires, hunting/trapping, and littering. Horseback riding is allowed by permit only. No motor vehicles are permitted on the land. The FLLT would also like to note that the six-acre enclosed parcel is not open to the public, and is marked off to identify boundaries. Please make an effort to respect their privacy. The preserve is an excellent site to observe the beautiful area we live in. It’s various species of trees range from merely a few feet tall to heights that are difficult to see. The forest floor is covered in numerous ferns, flowers, shrubs, etc. Aside from the seemingly innumerable species of birds that inhabit the forest, there are many other animals such as frogs, salamanders, chipmunks, and deer, among others. Minimal parking is available at the trailhead and carpooling is recommended. A project is in the works to create a small parking lot at the trailhead, in order to better mark the trail and allow for additional parking. Any problems with this website please call us at (607) 844-8888.